This is the ninth chapter in the Little Black Book of Scams. Good deals can bait you into falling for expensive traps. 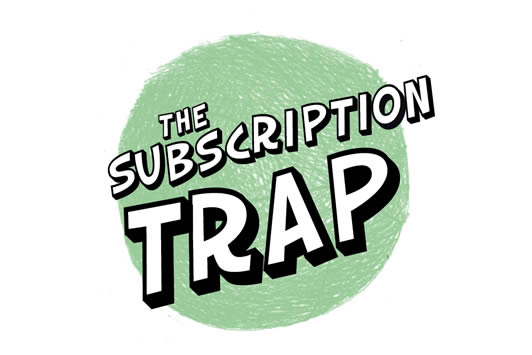 A subscription trap can trick you by offering “free” or “low-cost” trials of products and services. Products commonly offered are weight loss pills, health foods, pharmaceuticals and anti-ageing products. Once you provide your credit card information to cover shipping costs, you are unknowingly locked into a monthly subscription. Delivery and billing can then be difficult, if not almost impossible, to stop. Scammers use websites, emails, social media platforms and phones to reel people in. Remember, high-pressure sales tactics like a “limited time offer” are often used to rush you into making a decision. ✔ Trust your instincts. If it’s too good to be true, don’t sign up. ✔ Before you sign up for a free trial, research the company and read reviews, especially the negative ones. Consumer Protection is a great source of information. ✔ Don’t sign up if you can’t find or understand the terms and conditions. Pay special attention to pre-checked boxes, cancellation clauses, return policies, and any vague charges. ✔ If you go ahead with a free trial, keep all documents, receipts, emails, and text messages. ✔ Regularly check your credit card statements for frequent or unknown charges. ✔ If you have trouble cancelling your subscription, contact your credit card provider or your local consumer protection organisation.